The Deep Decarbonization Pathways (DDP) teams build and bring to the public debate realistic decarbonization pathways to 2050. These are designed to deeply reduce carbon emission while satisfying socio-economic objectives. We do this country by country considering in each case the specific context, and highlighting key drivers of the transformation and their potential effects. This approach was first used in a project carried out ahead of COP21, in 2014-2015. Research teams from 16 of the countries producing the largest amount of carbon emissions proposed decarbonization pathways for their economies and brought them to the domestic and international debate. These efforts contributed to the China-USA dialogue ahead of COP21 and led to the mention of “long-term low carbon development strategies” in Article 4.19 of the Paris Agreement. Today, the DDP initiative aims at extending its work to new countries, strengthening the relevance of sectoral analysis and encouraging domestic and international debate. To this end, the initiative is conducting a number of projects covering different geographical areas and topics. Special efforts are made to ensure that its findings are available to all, in the most relevant and user-friendly way. DDP projects use a common approach to design pathway across geographies and focus topics. This is based on a rigorous yet flexible framework that all stakeholders can adopt, with or without modelling tools. This approach is proposed on an open source basis, so that every government or stakeholder can propose and test its own pathways. enabling their communication and comparison through standardised outputs in a transparent way. The comparability is important because it allows a constructive debate among stakeholders with different interests within a country, as well as on an international level. Knowing and understanding the strategies of other countries allows to learn from each other and to identify useful cooperation areas (e.g. joint R&D efforts). Storyline – Developing a narrative that describes the evolution of decarbonization drivers covering the economic, demographic, technical, organisational, and behavioural dimensions. Computation – Compiling these assumptions and calculating their effects through detailed indicators. These calculations can be done through modelling tools, expert-based assessments and more general estimates. The pathway building tool proposes a user-friendly approach to this step. 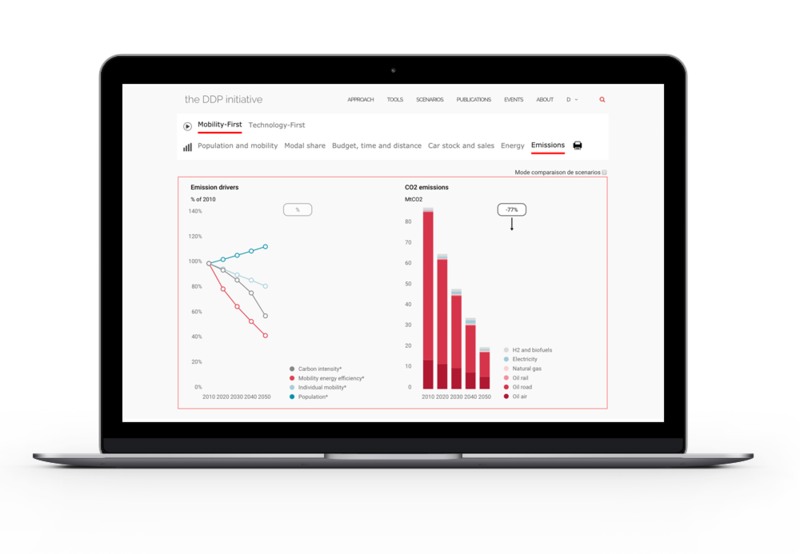 Dashboard report – Providing a quantitative representation of the pathway, showing its components and effects, through selected indicators. These are the most relevant for comparison and policy debate. Check – Verifying the consistency of the pathway based on the indicators across its interrelated assumptions. In case of inconsistencies, the design should return to step 1. Communication – Visualising the pathway and its key elements with graphs. The pathway comparison and building tools available on this website put the emphasis on steps 1 and 5, which are the most relevant for policy dialogue. But, for the purpose of transparency, the data structuring the computation in the building tool (step 2) can be accessed and the complete dashboards (step 3) supporting the comparison tool are made available as spreadsheets. The DDP initiative encourages the development and the structuring of a global scientific community of analysts working on the country-based assessment of ambitious climate objectives, in line with the Paris Agreement. the engagement of stakeholders though debates around the comparison of pathways proposed by different actors. 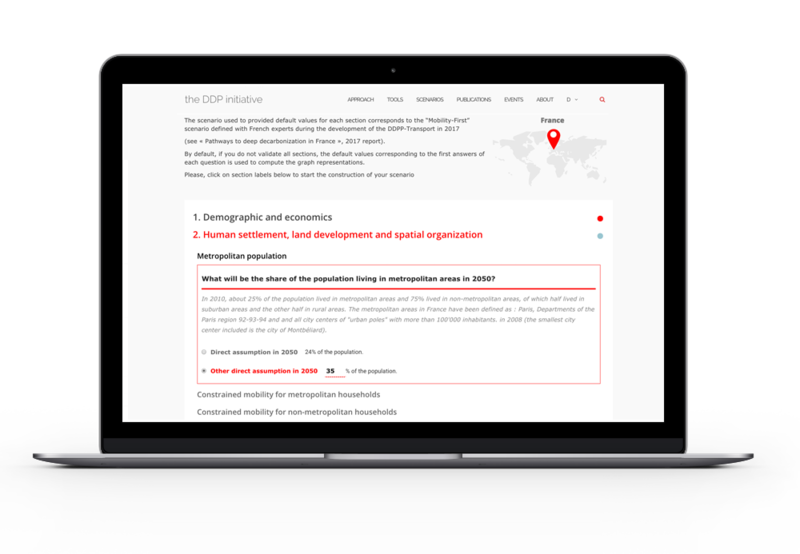 At the global scale, the pathway comparison tool (and the database supporting it) provides a reference point for the collection of studies undertaken in independent projects. It aims notably at feeding the Working Group III contribution to the Sixth Assessment Report of the Intergovernmental Panel on Climate Change (IPCC), and in particular its Chapter 4. This contribution occurs through collective publications, such as the 2016 Special Issue of Climate Policy presented in the previous DDP project. It also involves the participation of members of the DDP community, such as Henri Waisman, as Coordinating Lead Author of Chapter 5 ("Sustainable Development, Poverty Eradication and Reducing Inequalities") of the IPCC Special Report on a 1.5°C Global Warming.